Fresh air and cool breeze are guests that are always welcome in your home. But there's no reason to choose between them and bugs, or other unwelcome creatures. Our Screen Doors help you air your home every day and leave the pests out. Made of light-weight security mesh and very cost-effective, they're the best way to air your home. Do remember though, that they're not meant to keep out intruders. Unless the intruder is a beetle. 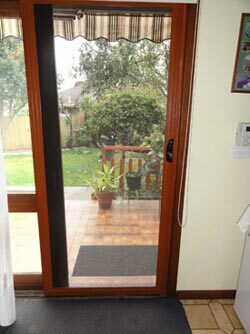 You can also opt for a pet door, to let your pet move in and out freely, without leaving the door open for any reason. 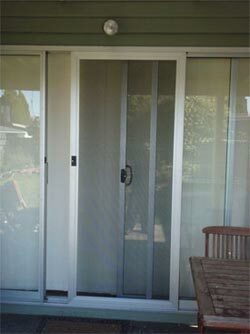 We offer two kinds of Screen Doors: Sliding Doors and Hinge Doors. Consisting of an aluminium frame, these security doors are made with the best quality light-weight fiberglass-woven mesh or Aluminium Tuff Mesh. You can also opt for window fly screens in Melbourne, on your windows, which allow you to enjoy the sunshine and fresh air all day, without worrying about mosquitoes or bugs. At AAA we offer you industry standard colour range fly screens in Bentleigh, Dandenong & other surrounding suburbs. If non-standard colour is required we can offer a powder coating service to meet your request.